Please come join me and fellow artisans this coming Saturday for the Takoma Park Holiday show. There is no admission fee and parking is available. I will have a large assortment of painted boxes as well as my tavern signs. See you there. On Saturday November 10th,, artists from across the United States who had artwork in the permanent collection at the National Portrait Gallery at the Smithsonian, were honored at a reception called Face Forward to celebrate contemporary artists and the power of portraiture. I am fortunate to be one of those artists. It was a wonderful event with music, food, and a chance to sit for a sketch done by a team of quick sketch portrait artists. We were also able to see the newest exhibition called Eye to I:Self Portraits from 1900 to Today which was curated by Brandon Fortune, chief curator at the Portrait Gallery. Please join me and other artisans for the 33rd annual Show at the Wilton Historical Society in Wilton, Connecticut on Friday November 2nd and the 3rd from 10 to 5. There is a special preview party on the evening of November 1st. 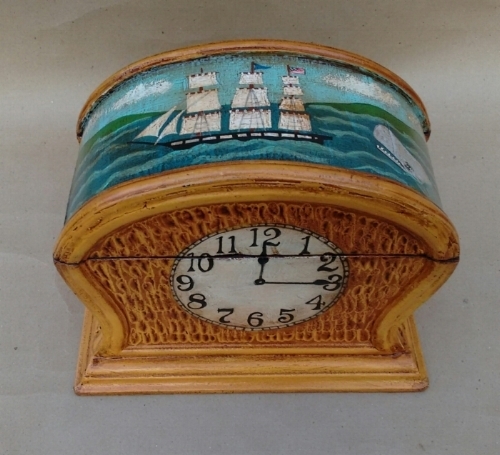 I will be selling vinegar grained boxes, whaling and nautical boxes and paintings and Tavern signs. I just completed a four week artist in residency at the Resurrection St. Paul school in Ellicott City, last Friday. I worked with the entire fourth grade and the school art teacher, Michele Rupert. The project was jointly funded by the school and the MD. State Arts Council. We painted four 2 ‘ x 8’ panels that depicted a gardens. Two of the panels were created in an up close perspective of the flowers and garden creatures. The other two panels depicted before and after views of the students creating a garden. The school is a designated butterfly garden and they do a monarch release each year as well as build bird houses and boxes for mason bees. With the approach of Autumn, I always think of owls. Perhaps, because as a child, I always associated them with Halloween. Those big scary eyes, the way they could turn their heads around, and their haunting night calls, made me think that they were somehow spirits of the night. I created this Tavern sign, imagining an old Inn in the mountains, where you would fall asleep in your soft bed, to the sound of their calls. August and September are wonderful months to see whales in New England. During the height of the whaling era, Nantucket was the center of the world whaling industry. For years I have read accounts of the men who worked on the whaling ships and I don't know who had it worse, the men or the whales. Many times the men would not live out the length of the voyage which could last several years, or they were not paid at the end of the journey. They were the coal miners of their generation. They took on very dangerous work to keep the world in whale oil to light the lamps. I had a wonderful group of students attending my vinegar graining class at Common Ground at Mcdaniel College, the week of June 25th through the 29th. During the 15 hours of instruction, they learned the basic formulas for mixing vinegar paint and the techniques to create the textures and final varnishing. Each student took home a small chest, and an assortment of small boxes and frames which they had grained. Come and join me for a week long class on Vinegar Graining at Common Ground on the Hill at McDaniel College in Westminster, MD from June 25th through the 29th. During our 15 hours together, you will learn the vinegar grain formulas and techniques that date back to George Washington's time. You will return home with a jewelry box and some small frames and the knowledge to let you tackle bigger pieces of furniture. I only take 8 students. Must be 16 or older. I am a teaching artist with the MD State Arts Council. In 2016 I created a mural with the fourth grade at an Ellicott City school, to honor the men and women in science. I told the children about Mr. Bean and how he walked on the moon and then decided he wanted to become an artist and make paintings of his experience on the moon. Talk about amazing! What a great project to inspire young (and older) minds. Thanks for putting me near Thomas Edison and Albert Einstein. I was fortunate to be the first artist with the opportunity to be in the center of the action to capture what I saw and felt and bring it back to earth to share with generations to come. It is my dream that on the wings of my paintbrush many people will see what I saw and feel what I felt, walking on another world some 240,000 miles from my studio here on planet earth. Our generation will be remembered for many achievements, and one of the greatest will be our movement off the earth, from its gravitational pull, to begin our future generations’ exploration of the universe. My paintings record the beginnings of a quest never to end, our journey out among the stars. I was at the Market Square show two weeks ago in Valley Forge and had the privilege of meeting Todd Spahr, a woodworker who specializes in building tables, sideboards, coffee tables and benches using 200 year old barn wood. I had been looking for months. Just got delivery of my new 6 foot dining table. January 19, 1809 was the birthday of Edgar Allan Poe. In his forty short years of life, he created a wealth of short stories, poems and created the genre of the forensic detective novel. Found delirious on the streets here in Baltimore, he was taken into Johns Hopkins Hospital where he died on October 7, 1849. The causes of his death are still debated today. When I created this portrait of him last year, I wanted to show the depths of his passion and his deep understanding of the intense human opera we all share. Join us at 4 pm at the Poe Monument in Baltimore at 4 pm on Saturday January 20th. If you would like to find out more information about the event and donate to it, here is the link. I will be part of the Holiday Art sale at the Takoma Park Community Center located at 7500 Maple Avenue in Takoma Park, MD on December 9th, from 10 am to 4 pm. Featuring work by over 30 local artists and artisans, there will also be food and music. I will be participating in the 33rd annual American Artisan Show at the Wilton Historical Society in Wilton, Connecticut on November 3rd, 4th and 5th. My booth will feature my vinegar grained boxes and small chests, Early American Tavern signs, paintings and giclee prints. I hope you will join us there. Early American Vinegar graining is a class that I teach at the Chautauqua type event known as Common Ground on the beautiful campus of Mcdaniel College in Westminster, MD. Every afternoon during the first week of classes at Mcdaniel College, I worked with eight students, demonstrating the formulas for mixing vinegar paint and the techniques for creating the textures. 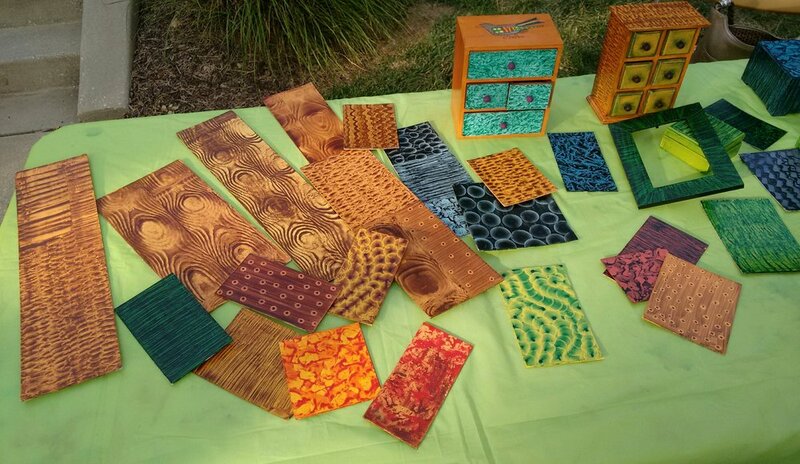 By Friday July 1, each student had completed 15 hours of work on a group of frames and small jewelry boxes. I had a wonderful group of students this year. Our final show displayed the gorgeous textures and colors that each student created on their work. This is a week long class that I have taught at Common Ground program for the past six summers. Come and join me on the beautiful campus of McDaniel College in Westminster, MD and learn the Early American artform of vinegar graining. The class is every afternoon June 26th through the 30th for a total of 15 hours. You will learn the history of vinegar graining, the formulas for mixing vinegar paint and use of objects to texture your project. At the end of the week you will leave with a small decorated jewelry chest and a group of small frames. You will be armed with the knowledge that will let you tackle bigger furniture projects when you get back home. For twenty days, I worked with the entire fifth grade at Veterans Elementary School in Ellicott City, MD to create a four panel mural depicting a Butterfly Garden. The four panels, each measuring 4' x 7' were put on display in the school lobby on June 2nd to be part of the PTA celebration of the 10 year anniversary of the new school building. The mural was funded by grants from the Howard County Arts Council and the Veterans Elementary School PTA. Each of the 140 5th grade students drew and painted at least one image on the mural. The panels will be installed this summer. This will be the 44th year of the MD Sheep and Wool Festival. It is the largest fiber festival in the United States. May 6 and 7th at the Howard County Fairgrounds. Sheep dog trials, sheep shearing, juried artisans and gourmet food. $5.00 for 18 and over with children free. Come and find me in the Main Exhibition Hall booth B32 and see my decorative boxes and small paintings. In October of 2010, I was commissioned by my friends Carol and Tommy Garvey to create a mural in their 300 year old summer house located in Brewster, Massachusetts on Cape Cod. Working with Carol's historical knowledge, I created the tiny original Cape house built in 1710 and the barn, and showed the new orchards and fields. Whaling boats are shown on the water. I painted the mural in the style of Early American itinerant artist Rufus Porter. The house and farm were sold to Captain Anthony Brier in 1867 and many additions were made to the house to turn it into a summer boarding house. Carols grandparents, William and Ada Wilson bought the house in 1947 and in 1986, Tommy and Carol purchased the house to keep it in the family. The articles and photos appear in the June issue of Early American LIfe Magazine. I received a grant funded by the MD State Arts Council and St. Mark School in Catonsville to work with the 5th grade and create a 4' x 8' mural that depicted the Chesapeake Bay. The students studied photos of crab boats and fishing boats particular to the Chesapeake Bay as well as fishing shacks, bird sanctuaries and crab fisherman. Boating, fishing and bird sanctuaries are also included on the mural. The mural panel was completed on March 24th and will be on display at various art events at both the school and church social hall before it is permanently installed in the school. For the past week and a half, I have been working with the entire 5th grade at St. Mark School in Catonsville to create life on the Chesapeake. The children are drawing and painting crab boats, fishermen, fish shacks and wildlife along with images of their school taking part in activities with the Chesapeake Bay Foundation teaching boat. The project was jointly funded by the school and the MD State Arts Council as part of their artist in residency program. Our project has been delayed with the snow and ice storm, but we will be finished with the 4' x 8' mural panel by the 24th of March.